I discussed the Menologium's lush picture of August in this post, but I can't resist pointing out again that the description of autumn as wæstmum hladen, 'laden with fruits', employs the same word as two of the most famous descriptors of autumn in English poetry: Blake's praise of 'Autumn, laden with fruit' and Keats, of course, for whom Autumn conspires to 'load and bless with fruit the vines that round the thatch-eves run'. 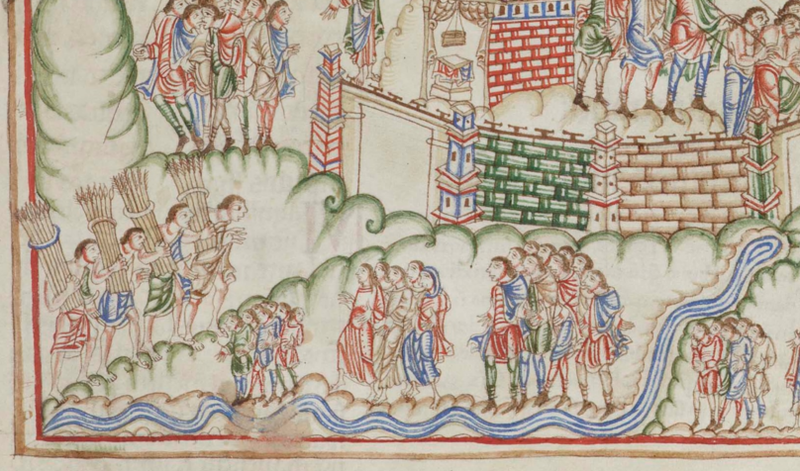 Though more concise than the Romantics, Old English poetry is no less rich in pen-portraits of the natural world, so in this post we'll look at one or two more brief descriptions of harvest in Old English literature. beorhte bleda beornum and ðearfum. to give bright fruits for nobles and the needy. blæd is another useful bit of Old English harvest-vocabulary: it can refer to blossoms and leaves as well as fruit, all kinds of things which bloom and flourish. 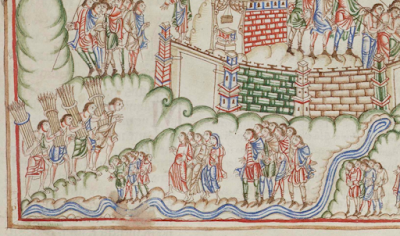 Here's a longer description of harvest from The Phoenix, a poem preserved in the Exeter Book. This poem describes the legend of the regenerating phoenix (based on a Latin source), which is interpreted as an allegory of Christ's resurrection and of the rebirth of the redeemed human soul. It also contains some of the loveliest descriptions of the natural world to be found in Old English poetry: the phoenix lives in a paradise of eternal summer, but this allows the poet to sketch beautiful little vignettes both of that glorious summer and of the winters and autumns and springs of this earth, which never touch that land. A translation of the whole poem can be found here. The following extract (lines 240-259) comes after the poem has told how the rebirth of the phoenix is kindled by the intense heat of the summer, 'when the sun at its hottest, jewel of the heavens, shines above the shadows'. We've already seen harvest described as a time of wela and ead, 'wealth' and 'blessing, richness', and here it's both: eorla eadwela, 'the blessed plenty of men'. This period of abundance is joyous and beautiful but necessary, too, as the harvesters lay in a store of sustenance for the winter months ahead, when frost and snow will 'wrap the earth in winter weeds' (wintergewæde - fantastic word!). There's emphasis on both the necessity and the pleasure of eating: food is sustenance (ondleofa, wraðu) but feasting is also wynsum and a time of gefea, which both suggest joy and pleasure. Hence harvest festivals, and the celebration still often today called 'harvest home' - it's nice to see that familiar alliterative collocation in this extract of harvest and home (on hærfeste ham gelædeð). and on heora sceafas berað, swa hi gesamnedon. and bear their sheaves, which they have gathered. It would be remiss to spot the word sceafas, even in this Biblical context, and not mention the connection between sheaves and one of the most important (if obscure) legendary heroes of Anglo-Saxon literature: Scyld Sceafing, the great king of the opening lines of Beowulf. Scyld is an ancestor of the royal houses of Wessex and Denmark, and seems to be the son of a figure named Sceaf, a name which means sheaf, as in corn. According to one version of the story, Sceaf (or Scyld himself) was found as a child drifting in an open boat with a sheaf of corn at his head. Taken ashore, he grew and flourished and became a famous king, in whose time there was great prosperity. On his death his people returned him to the waves, sent out to sea in a boat laden with treasure. He left a son named Beow (which means 'barley) of whom Beowulf says 'blæd wide sprang' - his 'fame spread far and wide', but with a pun on the word I mentioned earlier, blæd, 'growth, harvest'. Somewhere amid this conflicting mass of legend we can probably discern a pre-Christian fertility myth - an Anglo-Saxon hero of the harvest. grenu wexað, and gearwað, and ripað, for þat hy eft onginnað searian - 'grow green, and reach maturity, and ripen, and with that begin again to wither'. That's a later stage of autumn, explored in this post on the fall of the leaves. 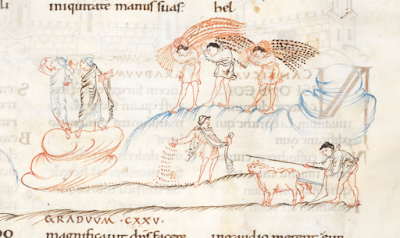 Elsewhere on this blog you can also find posts for the beginning of winter on 7 November, spring on 7 February, and summer on 9 May, looking at how those seasons are described in some Anglo-Saxon poems.